Closure of the northbound service road. Access maintained to Exits 9A and 9C. Follow signed detour. Closure of Exit 9B. Follow signed detour. Lane restrictions from two to one on the ramp from Rte. 6 West to I-295 North. Delays anticipated. Closure of the southbound service road. Access maintained to Exits 9C and 9A. Follow signed detour. Minor delays anticipated on ramp from Rte. 6 East to I-295 South given closure of southbound service road. Closure of on-ramp from Hartford Ave. West to I-295 South. Left turn access off Hartford Ave. to I-295 South used by Hartford Ave. East traffic. Please note: At the new traffic pattern on I-295 South, make sure you stay on the highway for Exit 9A for Route 6 to Providence. Don't take the first exit (9C), which is now Hartford Avenue only. Providence: I-95 North, from Exit 18 to Exit 19, lanes are currently shifted to the left. Please note: traffic entering the highway using the Allens Ave./Thurbers Ave. on-ramp to I-95 North must yield to traffic before merging onto the Interstate. Expect delays on the ramp; consider alternate routes during peak travel periods. Providence/East Providence: As part of ongoing repairs to the Washington Bridge Westbound, Exit 3 (Gano St.) off of I-195 West is closed through Fall 2019. Follow signed detour. Cranston: I-95 North, from Park Ave. to Exit 16, alternating lane closures for survey work, Mon.-Thurs. nights from 8 p.m. to 5 a.m. Please note: two right or two left lanes are anticipated to close at 8 p.m.; if a third is needed, it would close at 11 p.m.
East Providence/Providence: I-195 East and West, from Broadway to the Washington Bridge, left lane closures for bridge work, Sun.-Thurs. nights from 8 p.m. to 6 a.m.
Providence: I-95 South, from Exit 23 to Exit 24, and I-95 North, from Exit 24 to Exit 25, alternating lane closures for bridge work, Mon.-Thurs. nights from 9 p.m. to 5 a.m.
Richmond: I-95 North and South, from Exit 3 to Exit 5, left lane closed for bridge work, Sun. night from 10 p.m. to 6 a.m. and Mon.-Thurs. nights from 9 p.m. to 6 a.m. Please note: Rte. 3 North and South under the bridge will be closed during these operations Mon.-Thurs. nights from 9 p.m. to 6 a.m. Follow signed detours. West Greenwich: I-95 North and South, from Exit 5 to Exit 6A, partial right lane closures in a moving operation for sweeping, Mon. night from 9 p.m. to 6 a.m.
Cranston/Johnston: I-295 South, under the Phenix Ave. Bridge, and I-295 South and North, under the Scituate Ave. Bridge, shoulder closures for construction through September 2019. Cumberland: I-295 North and South, from Exit 20 to Exit 22, bridge work behind barrier, weekdays from 7 a.m. to 3 p.m.
Hopkinton/Richmond: I-95 North and South, from Exit 2 to Exit 3, lane shifts for bridge work through June 2020. Providence/East Providence: Lane shifts are in place on I-195 West, from just after Broadway to the Washington Bridge, and I-195 East, from Pawtucket Ave. to the Mass. line. Rte. 6 East, all traffic shifted to the left just after the Hartford Ave. exit. Both eastbound and westbound lanes are narrowed and located on the westbound side of the highway. Rte. 6 East at Broadway, exit closed for construction for approximately 24 months. Follow signed detour. Rte. 10 North, from Union Ave. to the Tobey St. overpass, traffic shifts to the temporary Rte. 10 North and temporary Westminster St. ramp for approximately 24 months. Traffic shifts to the right on Rte. 6 West, from the Tobey St. overpass to Hartford Ave. for approximately 12 months. Traffic shifts on Broadway, from Barton St. to Olneyville Square for approximately 12 months. The lane split on the Rte. 6/10 Connector outbound has shifted one-half mile to the north of its current location. Also, traffic from the Tobey St./Harris Ave. on-ramp does not have direct access to Rte. 10 South and needs to follow a detour using Rte. 6 West. Daytime work anticipated behind barrier at the 6/10 Interchange. Cranston: Rte. 37 West at Exit 1A, exit closed for drainage work, Mon. and Tues. from 9 a.m. to 2:30 p.m. Follow signed detour. Westerly: Rte. 78 East, from the Conn. line to Exit 5, will be closed for milling, Mon.-Thurs. nights from 8 p.m. to 6 a.m. Follow signed detour. East Greenwich/North Kingstown: Rte. 4 South, from Division St. to Rte. 1, lane and temporary ramp closures in a moving operation for sweeping, Mon. night from 11 p.m. to 6 a.m.
Portsmouth/Tiverton: Rte. 24 North and South, from West Main Rd. to the Mass. line, right lane and temporary ramp closures in a moving operation for sweeping, Wed. night from 9 p.m. to 5 a.m.
Johnston: Rte. 6 East and West at the I-295 interchange, alternating lane closures and lane shifts for bridge work, Mon.-Fri. from 7 a.m. to 3 p.m.
Portsmouth: Rte. 24 North and South, to just after the Sakonnet River Bridge to Rte. 114 (West Main Rd. ), lane and shoulder closures possible in a moving operation for construction, Mon.-Fri. from 9 a.m. to 3:30 p.m.
Providence: At the Rtes. 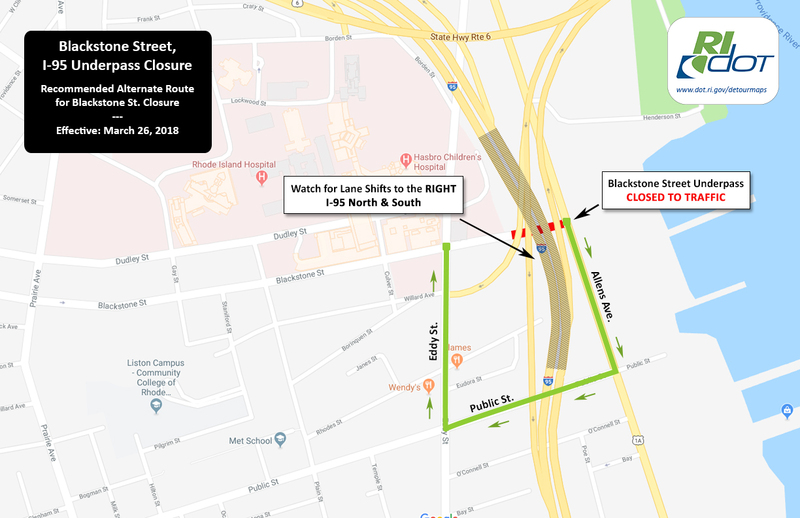 6/10 Connector North, from just south of Westminster St. to north of Broadway, right lane closed for construction, Mon.-Fri. from 9 a.m. to 2 p.m.
Warwick: Rte. 37 West, from Exit 4B to Exit 3, left lane closed for drainage work, Wed. and Thurs. from 9 a.m. to 2:30 p.m.
Westerly: Rte. 1 (Post Rd.) North and South, from #336 to Wagner Rd., left lane closures for guardrail installation, Mon.-Fri. from 8 a.m. to 4 p.m.
East Providence: The on-ramp from Warren Ave. North to the Horton Farm Bridge will be closed for guardrail installation, Sun. and Mon. nights from 9 p.m. to 6 a.m. Follow signed detour. 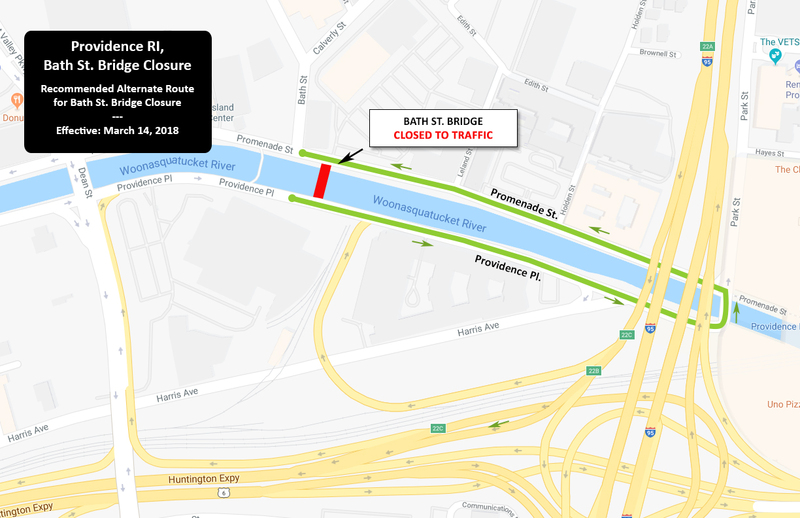 Providence: The on-ramp from Allens Ave. to I-95 North will be closed for construction, Sun. and Mon. nights from 8 p.m. to 5 a.m. Follow signed detour. Cranston: Rte. 12 (Park Ave.) East at the Park Ave. Bridge over the Pocasset River, from Gansett Ave. to Dyer Ave./Budlong Rd., is closed for bridge demolition through December 2019. Follow signed detour. Providence: Dorrance St., east of Dyer St. will be closed for construction through June 2019. Providence: The left lane is closed for bridge repairs through late Summer on Providence Place and Promenade St., at their intersection with Park Place and the rear entrance to Providence Place Mall. Cranston: Wellington Ave. under the Wellington Ave. Bridge, alternating traffic for bridge work, Sun.-Thurs. 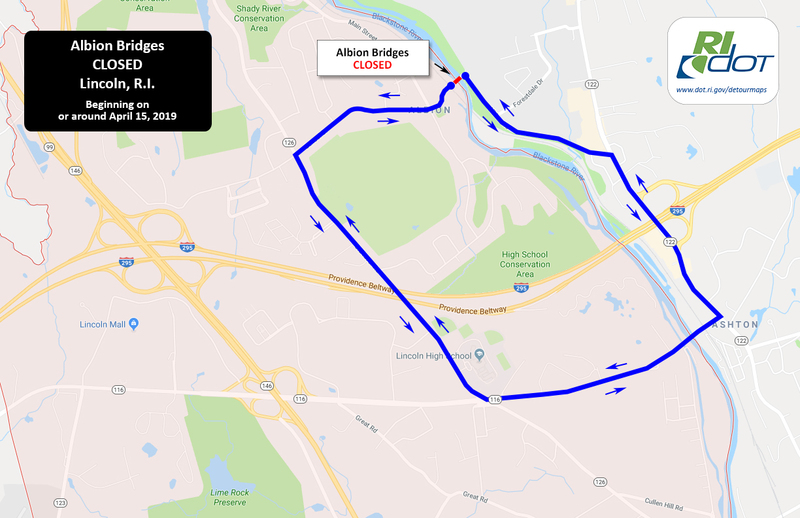 nights from 7 p.m. to 6 a.m.
Cranston: Thurbers Ave. South, under the Thurbers Ave. Bridge toward Allens Ave., alternating lane closures for bridge work, Sun.-Thurs. nights from 7 p.m. to 6 a.m.
Cranston: Elmwood Ave. at Park Ave., partial lane closures for construction, Tues. and Wed. nights from 8 p.m. to 5 a.m.
Providence: Rte. 1A (Allens Ave.) at Terminal Rd., watch for our crews in a moving operation for construction, Mon.-Thurs. nights from 8 p.m. to 5 a.m.
Cranston/Johnston: Rte. 14 East, from Sailors Way to the on-ramp to I-295 North, and Rte. 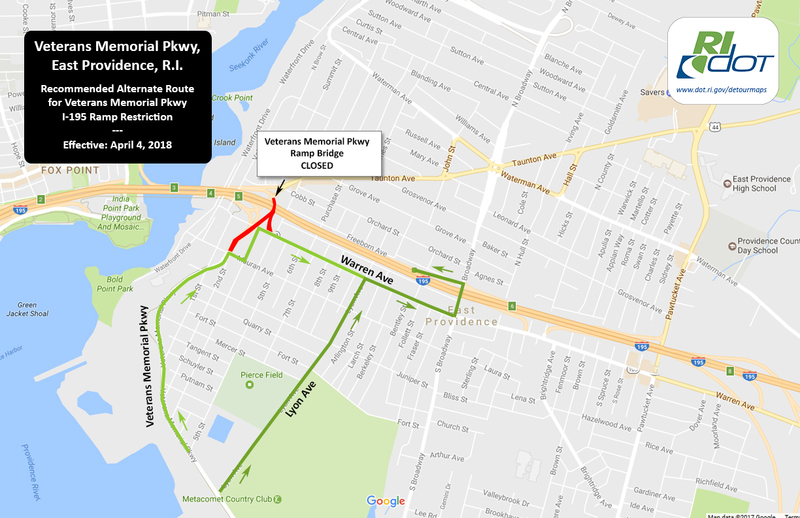 14 West, from Simmonsville Ave. to the on-ramp to I-295 South, left lane closures for construction, Mon.-Fri. from 7 a.m. to 3 p.m.
East Providence: Broadway North and South, from McCausland Ave. to Leonard Ave., shoulder closures and lane shifts possible for bridge work, Mon.-Fri. from 9 a.m. to 3 p.m.
Johnston: Shun Pike East and West at the I-295 interchange, alternating lane closures for bridge work, Mon.-Fri. from 7 a.m. to 3:30 p.m.
Johnston: Rte. 5 (Greenville Ave.) at the I-295 Interchange, off-road bridge work, Mon.-Fri. from 7 a.m. to 3 p.m.
Pawtucket: Roosevelt Ave. South under I-95, alternating lane closures for bridge work, weekdays from 7 a.m. to 3 p.m. through May 2019. Providence: Gano St. North and South, from India St. to Trenton St., alternating lane closures for construction, Mon.-Fri. from 9 a.m. to 3 p.m.
Providence: Branch Ave. East and West, from the on-ramp to I-95 South to the on-ramp to I-95 North, left lane closures for bridge work, Mon.-Fri. from 9 a.m. to 3 p.m.
Providence: Rte. 126 (Smithfield Ave.) East and West, from the on-ramp to I-95 South to the on-ramp to I-95 North, left lane closures for bridge work, Mon.-Fri. from 9 a.m. to 3 p.m.
Providence: Cladrastis Ave. East and West, from Maple Ave. to Floral Ave., right lane closures for a bridge inspection, Tues. from 8 a.m. to 3 p.m.
East Providence: The left lane of the East Shore Expressway is currently closed through Summer 2019. Providence: Visit the City of Providence’s online calendar for traffic restrictions. Barrington: Barneyville Rd. North and South, from Sowams Rd. to Warren Ave. in Swansea, Mass., road closed for milling, Tues.-Fri. from 7 a.m. to 3:30 p.m. Follow signed detour. Barrington: Washington Rd. North and South, from South Lake Dr. to Glen Ave., alternating one-way traffic for bridge work, Mon.-Fri. from 9 a.m. to 3 p.m.
Barrington: Nayatt Rd. East and West, from Washington Rd. to Rumstick Rd., alternating one-way traffic for drainage work, Mon.-Fri. from 7 a.m. to 3:30 p.m.
Middletown: Rte. 138A (Aquidneck Ave.) at Purgatory Rd. and at Crescent Rd., alternating lane closures for construction, Mon.-Fri. from 7 a.m. to 3:30 p.m.
Tiverton: Seapowet Ave. North and South, from Driftwood Dr. to Inlet Dr., alternating lane closures for a bridge inspection, Wed. from 8:30 a.m. to 4:30 p.m.
Tiverton/Little Compton: Route 77 (Main St.) North, from Warren Point Rd. to Nannaquaket Rd., partial right lane closures in a moving operation for drainage work, Mon.-Fri. from 8 a.m. to 2:30 p.m.
Cumberland: Marshall Ave. East and West, from Mendon Rd. to Garden St., will be closed for construction, Mon.-Fri. from 7 a.m. to 3:30 p.m. Follow signed detour. Cumberland: High St. North, from Mill St. to Dexter St., and Dexter St. East and West, from High St. to the Mass. line, partial right lane closures in a moving operation for drainage work, Mon. night from 9 p.m. to 5:30 a.m.
Cumberland: Rte. 122 (Mendon Rd.) North, from Marshall Ave. to Garden St., alternating lane closures for construction, weekdays from 7 a.m. to 3:30 p.m. through Fri. May 4. Glocester/Smithfield: Rte. 44 (Putnam Pike) East and West, from #648 to W. Greenville Rd., right lane closures for construction, Mon.-Fri. from 7 a.m. to 3:30 p.m.
Johnston: Rte. 6A East and West at the I-295 Interchange, alternating lane closures for bridge work, Mon.-Fri. from 7 a.m. to 3 p.m.
Scituate: Rte. 6 East and West, from Rte. 101 to Rte. 102, shoulder closures for construction, Mon.-Fri. from 7 a.m. to 3:30 p.m.
Smithfield: Rte. 7 (Douglas Pike) North and South, from Maureen Dr. to Whipple Rd., and Old County Rd. North and South, from Jaylin Dr. to Wolf Hill Rd., alternating lane and right shoulder closures for survey work, Tues. from 9 a.m. to 3 p.m.
Woonsocket: Rte. 114 (Diamond Hill Road) East and West at Mendon Rd., right lane closures for construction, Mon.-Fri. from 7 a.m. to 5 p.m.
Cumberland: Old Diamond Hill Rd., from Home Ave. to Diamond Hill Rd., is currently closed to motorists while it becomes a walkable path as part of the Diamond Hill Road project. Exeter: Rte. 102 North and South, from Sunderland Rd. to Rte. 2 (South County Trail), alternating one-way traffic in a moving operation for paving, Wed.-Fri. from 7 a.m. to 5 p.m.
West Greenwich: Hopkins Hill Rd. East and West, just before and after the Hopkins Hill Rd. 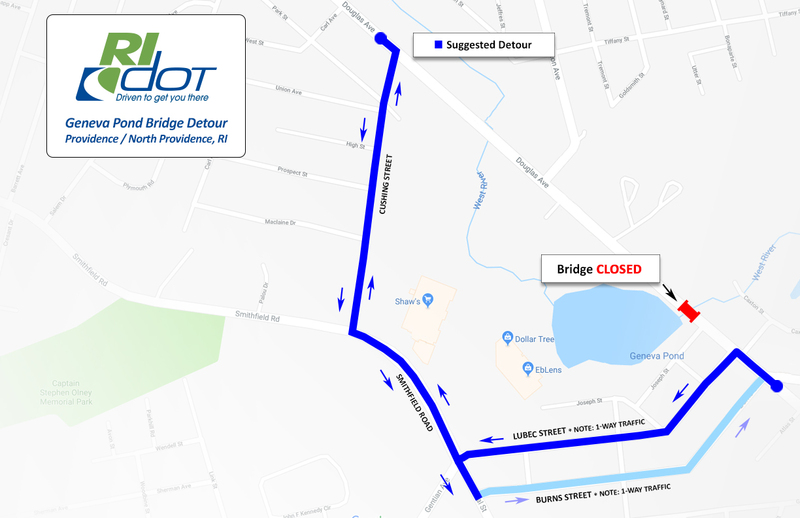 Bridge, alternating lane closures for bridge work, Mon.-Fri. from 7 a.m. to 3 p.m.
Charlestown/Richmond: Motorists are experiencing an alternating one-way traffic pattern controlled by temporary traffic signals, for bridge work, 24 hours a day on Rte. 112 North and South, from Butter Lane to Carolina Mill Lane. Expect delays. Hopkinton: Motorists are experiencing an alternating one-way traffic pattern controlled by a temporary traffic signal for bridge work 24 hours per day on Mechanic St. North and South, under the I-95 overpass. West Greenwich: Rte. 3 East and West, from Burnt Sawmill Rd. to Kitts Corner Rd., travel lanes reduced from 4 to 2 and eastbound and westbound traffic shifted to the west side of the Big River Bridge for construction through Spring 2019. West Greenwich: Rte. 102 (Victory Hwy.) North and South, over I-95 at the Victory Hwy. Bridge, lane shift and shoulder closures remain in place for construction, weekdays from 7 a.m. to 3:30 p.m. Motorists on Route 102 North and Route 102 South are now utilizing the new Northbound bridge as we rebuild the Southbound one. Warwick: Rte. 117 East at Rte. 2, road closed for bridge demolition through mid-Summer. Follow signed detour. Warwick: Motorists may continue to experience a continuous right lane closure for utility work on Rte. 117 (Centerville Rd.) East, from Commonwealth Ave. to Orchard Ave. through Fri., April 26. Delays anticipated. Coventry: Nooseneck Hill Rd. at Woodland Dr., right lane closures for construction, Mon.- Fri. from 9 a.m. to 3 p.m.
Coventry: Main St. at South Main St., right lane closures for construction, Tues.-Fri. from 9 a.m. to 3 p.m.
Warwick/Cranston: Rte. 1 North and South, from Pawtuxet Ave. in Warwick to 6th Ave. in Cranston, partial lane closures in a moving operation for construction, Mon.-Fri. from 9 a.m. to 3:30 p.m.
Coventry: Rte. 117 West, just before and after the Flat River Bridge, alternating one-way traffic for bridge work, weekdays from 7 a.m. to 4 p.m. through April 2019. Receive email notification when we change this page.